You can always try Chewbacca talk…No? Personally, Chewy-speak sounds way more fun. I’m embarrassed to admit I talk like Chewy more often than a grown person should. Sometimes that loud groan is the best answer for everything. I don’t know if this was your intention but the post was funny. I think his language would get on my nerves too. I hope your plan works. Oh yes, humor is always intended in this house. Glad you caught on. I will be so glad when this Pig Latin phase is over! It has lasted way longer than I thought it would. It doesn’t help that I think he and his friends speak it at school. The teachers must deal with this every year. I feel for them. You know have no idea what we deal with. Be glad for that. When it comes to things like this, I truly am. I rather hear those words than the dreadful teenage years.. how cute. As teens, my kids love to throw various memes at me that I might not know. Doge is the latest. Everything is Doge this and Doge that, but they put it in a form of a question to me. “Hey, Mom, do you think Doge would like that?” Or “Hey, Mom, can Doge have dinner with us?” And then they laugh at my cluelessness. It’s getting old. Quickly. Ugh. My spine just shivered for you. haha! my oldest is creating his own language – has an entire notebook filled with coded words that have no structure or code. so funny! Good luck, lady. This post made me laugh. I’m definitely interested in how this turns out. Please keep us updated. Now I definitely want to learn Ewok. Does Rosetta Stone offer a course? The things we never knew about Star Wars. Someone out there knows how to speak it perfectly, I can assure you. That kind of scares me. But yes, a course would be helpful. When I was a kid, my dad used to throw in German words that he picked up from the Army. It certainly made me stop and think. If I knew another language fluently, I’d definitely try that. I very much regret not paying more attention in French now. After four years of French, I can speak one sentence. I gave up on that long ago. I could say the words to “Adeste Fideles,” however, that I had to sing solo in Latin class. Etched in my memory forever due to the fact that I cannot sing. Go for the Ewok lingo. That would definitely make him envious and you a super nerd! If he found out about Ewokese, he would flip. And he’d learn it in a day too. I’d be done for. I’ll try it out at dinner this week and see what happens. Eye rolling I presume. He doesn’t read your blog, does he? Let me know how that works out! He thinks I made it up. If only I were so clever. I SOOOO feel your ear pain!! This should be fresh pressed, if not for all moms out there in the world getting paybacks (yeah, we all used Pig Latin). 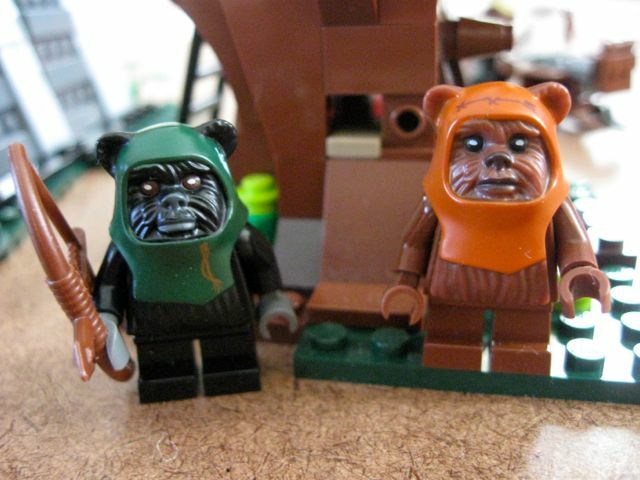 Ewokese? Never knew of such a thing. Great post, Karen. Should be fun stumping the tweens. I don’t know why Pig Latin drives me so crazy but I feel your pain! Dimples will sometimes make up words to answer me, and it drives me nuts. I think it bothers me because I have always have a secret fear that my brain is turning to mush and I will wake up one day unable to interpret simple words. And if that doesn’t work, there’s always Klingon . . .
Oh no, somehow I blocked out Pig Latin! I remember learning it…so, what age is your son? How long do I have before my daughter brings this home? Cracks me up envisioning you using Pig Latin to fellow moms without giving it a second thought. lol! I have fond memories of Pig Latin, but I am not looking forward to when my kids discover it.